Çukurova University Journal of Turkology Research (ÇÜTAD) has started to accept articles for June 2019 (4/1) issue. 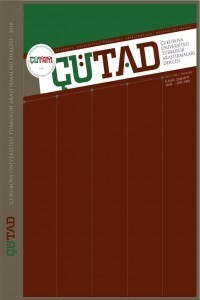 You can upload your research articles, translations and book review to the system at http://dergipark.gov.tr/cutad until 17 May 2019 Friday. The works to be sent to ÇÜTAD should be prepared according to the principles in the Writing Rules section. The manuscripts section contains an article in .doc format that can be downloaded by clicking the relevant link for the authors. The draft has been opened to prevent transmission errors that may arise in the layout work done outside the control of the author. The author should send his work into this draft text by copying it.